Mental health problems are often challenging to diagnose. Depression is a very common mental illness that can be related to many brain disorders. Treatment for depression depends on the root cause of the patient’s diagnoses and calls for a thorough examination. At Amen Clinics, we strive to identify the root cause of depression. Treatment for depression begins with a four-pronged method designed to give you the best possible individualized care. 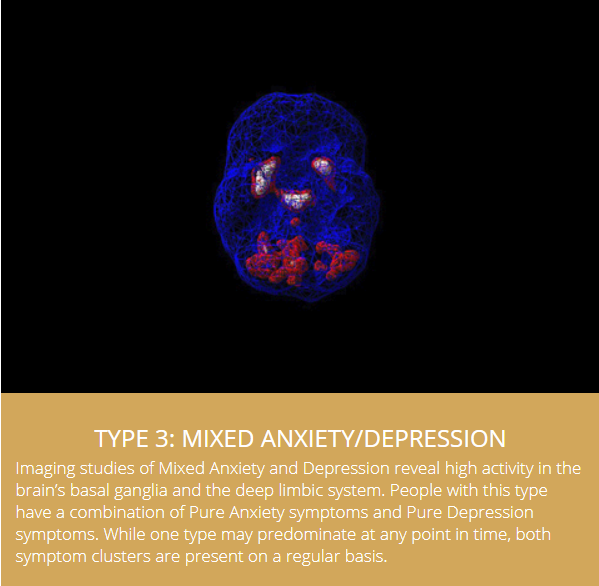 We are unique in using brain SPECT imaging to diagnose all types of depression. Most psychiatrists do not look at the organ they treat. This is why Amen Clinics has developed a system of looking at all aspects of a patient’s mental health, revealing many specific brain health problems. Brain SPECT imaging allows health experts to see where abnormalities are occurring in the brain. •	We will begin by taking the time to explore your specific biological, psychological, social and spiritual influences. •	Next, we will perform neuropsychological tests to measure various aspects of your brain function. •	Then, we will perform two brain SPECT scans: one at rest and one during concentration. •	Finally, we will order lab tests to rule out nutritional deficiencies, hormone imbalances, toxicity, etc.— if deemed necessary. 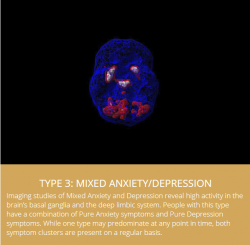 Not only does SPECT help identify proper treatment for depression with imaging, it also allows patients to overcome the emotional burden of seeking help for a problem they may not believe is physical. It is our goal to focus on natural treatments for depression. In some cases, antidepressants might be prescribed, but only when deemed necessary. Many people suffering from depression do not find SSRIs to be effective, and Amen Clinics is committed to finding treatments that work for you. Brain reserve is a concept we often talk about when a person has run out of the capacity to cope with stress. When lifestyle changes are not enough, we do not stop to help patients on their path to become better and have many treatment options available. Depression is not the same as situational sadness, however, grief can send a person into a deep depression as well. Losing a loved one, suffering a chronic illness, enduring a sudden injury, and taking on immense emotional burdens all cause stress to the body and can cause depression. Treatment for depression depends on the cause. Identifying your symptoms of depression and anxiety are the start to finding the root cause. Amen clinics is experienced with a diverse range of causes to depression and prepared to meet you individual needs. Suicidal depression requires immediate help. If you or a loved one suffers from suicidal depression, there are steps to take today to find treatment. Learn to recognize suicidal depression and prevent a tragedy for yourself and a loved one. Some suffering from suicidal depression choose to hide their pain while others show it and must be taken seriously. The most important aspect to overcoming suicidal depression is to offer help or seek help. Talking about depression is the first step to finding treatment for depression. Bipolar disorder treatment is not straightforward. Around 4% of Americans suffer from bipolar disorder, but at Amen Clinics we often find patients have been underdiagnosed or misdiagnosed. Many bipolar disorder patients suffer from ADD/ADHD, brain injury, or other problems which mimic and exacerbate the symptoms of bipolar disorder. Depression is very common with mood disorders as people experience manic and depressive states. These are serious brain disorders which must be properly diagnosed in order to identify treatment for the root cause of their depression. Following through on treatment for depression in mood disorders is challenging as patients often feel they are cured or never needed treatment once the treatment is effective. Finding professional help and a support network to aid with following through is essential. One common symptom of a brain injury is depression. Fluctuations in hormones, major life changes, and biological triggers all come into play when diagnosing depression for mothers. Postpartum depression treatment is offered by Amen Clinics to help mothers feel pride in their lives again. Many who suffer from depression are unable to find refuge from negative thoughts. These thoughts attack the patient’s mind and keep them stuck in a pattern of destructive behavior. One type of highly successful treatment for depression is ketamine injections. Ketamine opens a window of clarity for those suffering from depression to alleviate stress, enabling treatment under the guidance of health professionals. Those with depression experience similar symptoms to each other, but depression has many root causes. To find the right treatment for depression, it is essential to diagnose the problem. Amen Clinics is prepared to help you on your unique journey. Make an appointment by calling 888-288-9834 today or scheduling online, and review our locations to find the nearest clinic to your home. The post Treatment For Depression appeared first on Amen Clinics.